Well, we�re coming to the half way point in this year already! How is your modeling year going? Since the show, which was a �well worth effort�, everything has been packed away in the shed at home. Our Greerton base was leased out to a business, but we�re on the lookout for a new space. The show was well received by the public and exhibitors alike, with exhibitors all asking to attend if/when we do another show. Thanks go to those who assisted. 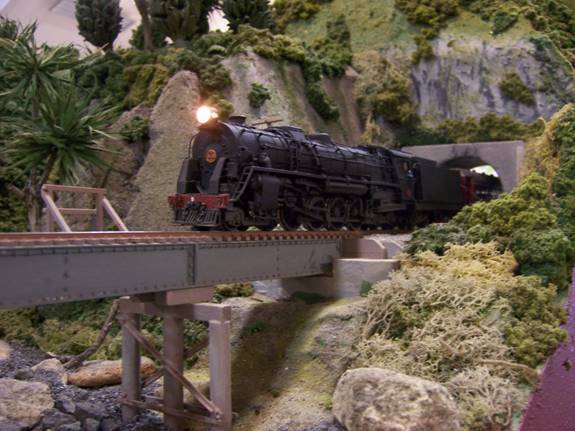 Ka 945 trundles onto the No.1 bridge with the daytime express. Now, we�re getting organized to attend the Taupo Show on 12-13 July. Anyone who can help on that weekend, please drop me a line. Couple of unique wagons, in 3/16th, recently constructed by Brett.